On May 24, the government began blocking a number of sites. Most of the blocking operations were directed against news sites and satellite channels broadcasting from outside Egypt. The number of sites blocked until 25 June – the date covered by the report – reached 75 sites. Press sites were not the only ones to be blocked. Sites of political campaigns and proxies have also been subject to block, increasing the total number of blocked sites until the date of this report at least 113. The blocking of the sites coincided with the beginning of the discussions in the Egyptian parliament of the agreement on the demarcation of the maritime border with Saudi Arabia, the block being a practical implementation of what the Egyptian president said in April last year, during his meeting with the representatives of Egyptian groups: “No one should bring up this subject again” commenting on the escalation of opposition against the agreement in political and media circles. The block of websites was the most accurate expression of the government’s intentions to close most platforms or outlets that carry voices of opposition. The block was not the only measure to prevent the press and the media from carrying out their roles. It was preceded by preventing journalists and media personnel from covering various events. During the first half of this year, AFTE’s Monitoring and Documentation Unit documented 49 cases of mass preventions of journalists from doing their work. June came on top of the list in terms of the number of violations committed against the press community, and government agencies and government officials came on top of the lsit of perpetrators. The newsletter details the violations against the press and media community in Egypt, which affected their professional performance and breached the rights, which were granted them by the Constitution, law and international covenants. The newsletter also reviews the number of violations, the bodies most exposed to them and the bodies that commit the greatest violations against press and media freedom. It also reviews the number of journalists imprisoned for their press work, whether sentenced or still in pre-trial detention, indicating the criteria on which AFTE relied to include cases in the list of imprisoned journalists. 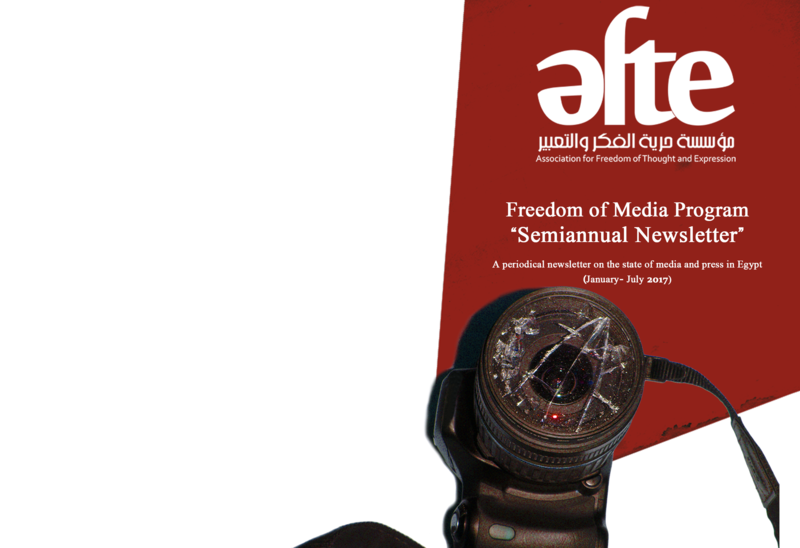 AFTE depended in its monitoring on the follow up by the institution’s teams in addition to postings on social networks and news websites as well as publications by human rights organizations and initiatives concerned with the situation of the press and media in Egypt. The research team then validates the information through direct communication with victims, their families or eyewitnesses, or via statements by victims on their personal social media pages, or through statements released by the media institutions, in which they work. Verification of the identity of the journalist: A press ID, a work permit or a delegation issued by a press institution, a press portfolio in a press institution, an official certificate by the press institution or its media platforms. Verification of the press institution: at least one of the following: a page, a website or a publication by the press institution in addition to a means of communication. Evidence that the journalist was on a professional mission during the time of the violation: at least one of the following conditions: work permit or authorization to carry out that professional mission, testimony by victim or eyewitnesses, confirmation by officials at the press institution on its media platforms. Private Egyptian channels: refers to private channels, which have their main headquarters in Egypt. Security bodies: including sectors of the ministry of interior, defense, military; also included in cases of attacks by “supporting or unidentified civilians” when in the presence of regular forces. Judicial bodies: all civilian or military judicial bodies. In case of diversity of press activities of the same institution, the reference will be made to the most structured and organized body. For example, “publication” will be used to describe the institution which produces a newspaper or an electronic website. Arrest: is the process of restricting freedom of the journalist, taking him/her to a police station and making a report. Illegal detention: is the process of restricting freedom of the journalist, taking him to a place of detention and then releasing him/her without making a report. Definition of a violation: Any violation that happens to an individual journalist in a specific place and time, to be determined by 4 main factors: place of violation, time of violation, type of violation and the person of the victim. For example: if 3 journalists were arrested in a certain incident and one of them was beaten and another verbally abused, this will be taken to indicate 5 violations (3 for arrest, 1 for physical assault and 1 for verbal assault). In the case of collective violation (prevention from coverage) it will be considered as a single violation, since it aimed at collective prevention from coverage rather than a violation against a particular journalist. It is also difficult in those daily incidents to accurately determine the number of journalists involved. Media personnel were subjected to 4 violations, while 29 journalists suffered and 13 photographers were subject to violations, in addition to 37 collective violations against journalists, photographers and media personnel. At the level of institutions, violations were recorded for 3 newspapers, 3 channels and 75 websites during the timeframe of the newsletter. Press websites and those affiliated to satellite channels and their staff of journalists were subjected to the highest number of violations (80) followed by 46 collective violations against various institutional journalists in addition to 27 violations against journalists and photographers in private Egyptian publications. Unidentified governmental bodies blocking websites committed the highest number of violations against press and media freedom during the first half of 2017 (75 violations) followed by judicial bodies (26), citizens (18) and security bodies (17 cases of violations). No. Date of arrest Name of journalist Profession and institution Judicial body Sentence Case no.